I had a fantastic time in Queenstown primarily I’m sure because it has officially moved to first place on my “the most beautiful places I’ve ever seen” list (knocking Tintagel in Cornwall, England to #2). I went with 5 friends and a 6th met us over there for the second half of our trip and we had a blast! Skiing, sightseeing, walking laughing and of course eating! 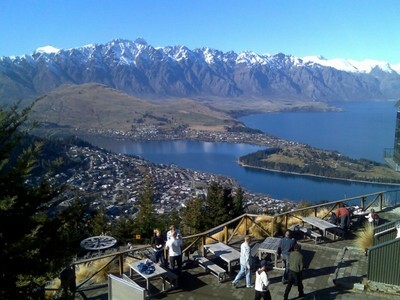 Here’s a shot of Queenstown I took from the lookout (had to take a gondola ride up there), that mountain range in the distance is “The Remarkables” and they so are!! We were staying down by the lake and our apartment had the dual view of the lake and the snow-capped ranges, so beautiful (did I mention this place was beautiful?). Dad certaintly must’ve been having a wonderful moment when he spoke this place into being! Magnificent! Oh, and I ended up going parasailing/flying on Saturday. The base-jumping was $100.00 more, so maybe next time! 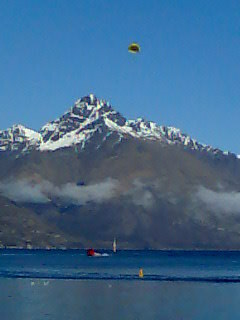 Here’s me with the ugly yellow smiley parachute (lol) flying over Lake Wakatipu, this is pretty much right up there among the most fun things I’ve done! The views were magnificent, and while it was a tad (read ‘very’) cold , I’d do it all over again without hesitation! I guess with all these shots it’d be easy to assume that this was the highlight of the trip, but really, even though it was a lot of fun, the best part was going away with friends and being able to enjoy the beautiful surroundings. I loved it. This was easily one of my favourite trips ever! Having said that, it’s great to be home though. I had a wonderful day today finalising the holiday stuff and reconnecting with my immediate future. Had a great chat with the Lord this afternoon and I’m very excited about the things he’s teaching me about who He is, who I am and how to share that with others. This entry was posted on Monday, August 7th, 2006 at 11:34 pm and is filed under Travel. You can follow any responses to this entry through the RSS 2.0 feed. You can leave a response, or trackback from your own site.